Editor’s Note: Our weekly guest spot is our effort to help our reading community connect with each other. “Being Isaac” is in response to our growing number of male readers. We think it’s important that there’s a male reply to our female’s call to live in passionate pursuit of Christ. Thanks StephenWhoElse for sharing this great post about giving God the reigns of our lives! Okay, let’s do a quick poll! Raise your hand if you believe God has good plans for you! Great, now raise your hand if you believe that God cares about all aspects of your life, big or small. Fantastic! Now, raise your hand if you are unhappy with your job, financial status or the current state of your life. Whoa, wait a minute. That’s a pretty obvious contradiction isn’t it? How can a loving, well meaning God put our lives in such a mess? Is it a mess? By whose standard? Ours or God’s? We have not read the last page in the story of our lives so I guess we don’t know how it turns out do we? The story of our lives are still being played out and God, our sovereign God, has the final act already planned and we – the good guys – will win! Amen! That’s well and good of course, but for those of us going through trials the suffering is very real, and painful. And not something we can brush aside with some feel-good words. Do we then reject these trials? What ought to be our attitude towards our struggles? Even in the midst of our most painful moments, we can trust God. But know this : if we want God to steer us out of this mess we are in, we’ve got to handover the steering wheel to Him.. Only by surrendering our lives to God can we emerge from our trials in victory. Let’s learn to trust Him by truly letting go and not try to “help out” by trying to do things ourselves. God does not need our help – He wants our trust and our surrender. Published with the permission of the author. Submit your own post at beingrebekah@outlook.com. I love your balance in having a male presence here, too. 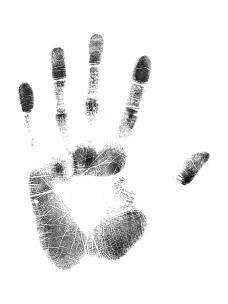 I loved the hand print picture – captured my attention! Thank You Brenda! We’ve been blessed with multiple males with good messages being willing to submit posts (although we are always looking for more guest posts- male or female) 🙂 God is good!